Morgan Hillam can often be found behind the counter at Vic’s, but you can also find her onstage as a featured dancer for the Mary Lynn Powell Ballet. Now that’s cool. Whattup Fiddy? Fiddy Cent, pictured above, is the second Bulldog from the 900 block of Main to be DDotM. Is this a trend? Fiddy is a year and a half old and belongs to Kara Reese of Vie Vie Luxe. Fuzzy Antler will be having a Holiday Open House November 5th & 6th, 10 - 5. Holiday decorations 20% off. Refreshments will be served. Lotus Day Spa is adding a hair salon, making them a Full service day spa as of Nov 1st! Ice. Cold. Slipping and sliding. Bring it on! 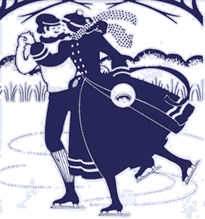 Weather permitting, our friends from Boulder Creek Events will be opening WinterSkate November 5th in its usual spot at the Steinbaugh Pavilion. The Louisville DBA and BCE will also be bringing you the Downtown tradition of FREE Horse Drawn Carriage Rides. 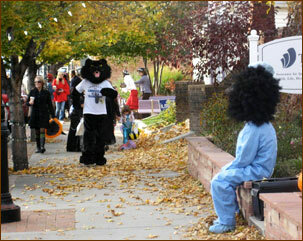 The Wildcat leads Louisville Elementary School K-5 students and teachers north on Main Street last Friday morning. That’s Eric Tussey on the right—looking good Eric! Louisville Elementary School has Trick or Treated on Main Street since The Autumn of Love—1967! Come Downtown Saturday November 6th to welcome a new member of the Historic Downtown family to Main Street. There will be vendors, food, free kids cooking classes and farm animals all in one place. Working side by side with a professional chef, this hands-on class for the aspiring cook between the ages of 12 and 16 years will give these young persons an unforgettable learning experience. To reserve your space for either of these classes contact Barbara Barton at 303-665-6850—cost is $40. Crazy Horse will be selling Women's Bean Project Lovingly Handmade Jewelry November to January. 100% of profits go directly to the jewelers. This non-profit business employs women who have experienced chronic unemployment, poverty, or difficult life situations.